An independent professional services firm providing financial planning and investment management with a fiduciary level of care. Our professionals specialize in helping business owners, corporate executives, professionals, and retirees—and their families—make smart decisions about their money. Using a comprehensive approach to wealth management, we combine personal financial planning with sound investment management to help you achieve your goals. We pride ourselves on matching the right advice to what is important to you. We base our advice on a thorough understanding of you and your needs, concerns, hopes and opportunities. Many families assume estate planning is for older people. That’s true, but millennials with dependents may have even more to lose if they unexpectedly die or become incapacitated. In an October GRBJ article, Steve Starnes, CFP® and Stephanie Mushna CFP® paired up with two local estate planning attorneys to describe the risks of dying “intestate” (without a will), and to propose some practical solutions for busy millennials. As a traditional time for family gatherings, the holidays also can be a good time to hold meaningful conversations about helping out (or being helped by) loved ones – especially if a family member is experiencing memory loss or other signs of dementia. In a GRBJ November 2018 article, Steve Starnes, CFP® offers practical advice on how families can approach care-giving conversations, while remaining sensitive to the delicate challenges involved. Even seasoned financial advisors may have questions about how to best assist aging clients, especially if those clients need long-term services and support (LTSS) due to a decline in cognitive or physical health. 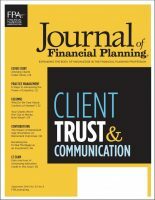 Our own Steve Starnes, CFP® co-authored a September 2018 cover story on the subject for the Financial Planning Association’s Journal of Financial Planning. Advisors and families alike should find the article of interest.